Gary is responsible for developing strategic product marketing direction and presenting the Amber Road brand and solutions worldwide. As the platform evangelist, Gary develops and launches customer insights, go-to-market plans, product messaging and content, and field marketing tactics which establish Amber Road’s solutions as a standard in the Global Trade Management space. Previously, Gary was VP, Industry Development for ecVision for 9 years prior to its acquisition by Amber Road. He also held marketing positions with tech companies where he was instrumental in implementing programs that yielded exponential growth and spearheaded alliance relationships with a range of third-party organizations. He has 20 years of active military service where his primary specialty was providing marketing support to Army National Guard recruiting and retention operations in New Jersey. Gary received a BS from the State University of New York and is currently pursuing a Master’s degree at Moravian College. He is a member of the American Apparel and Footwear Association, Footwear Distributors Retailers Association, Outdoor Industry Association, US Fashion Industry Association, Council of Supply Chain Management Professionals, and American Association of Exporters and Importers where he serves on various committees and planning groups. Dan Gardner is founder and president of Trade Facilitators, Inc., a Los Angeles based supply chain training and consulting firm. Prior to founding TFI in 2007, Dan spent 23 years in the Third Party Logistics business where he held senior level positions with Exel Global Logistics and DHL Global Forwarding. In addition to his professional experience, Dan spent six years as an adjunct faculty member of both The University of Miami and Florida International University’s graduate business schools, where he taught Global Logistics & Supply Chain Management. Dan holds an MBA from the University of Miami and has been a licensed customhouse broker since 1989. He has also been certified in Production & Inventory Management , holds a Black Belt in Six Sigma, and earned a certification by the American Society for Industrial Security as a Physical Security Professional. Dan Gardner, President, Trade Facilitators, Inc. When Introducing new Products, why Hasn't Total Landed Cost Played a More Prominent Role in the Vetting Process? ...the number of variables that go into calculating total landed cost across multiple products, countries and potential vendors make manual computations nearly impossible. Periodic Versus Continuous Planning - What’s Needed for Success? The procurement side of global supply chain management must consider a number of factors when introducing new products, beginning with decisions on where to source them. Historically, product quality, supplier performance and unit price have ranked amongst the top criteria for qualifying overseas vendors. However, we must ask ourselves why total landed cost hasn’t played a more prominent role in the vetting process. Our only explanation is that arriving at the data points fundamental to a total landed cost calculation are often times difficult to define, change frequently and are very challenging to capture on a consistent, uniform basis. While this central aspect of supply chain management is very important, many businesses rely on estimates, averages and even guesswork that often lead to inaccurate calculations. To properly gauge the financial success of a product, a landed cost model must capture the total cost of production, shipment and customs-related activities. Due to the fact that companies often don't have enough time or resources to analyze every potential scenario, they may miss opportunities for transportation and duty reductions. By assigning costs associated with the various components of a supply chain, a company can run product-specific simulations that identify optimal sourcing locations, rationalize networks and mitigate risk. Ultimately, these exercises allow businesses to run reality-based cost models that enhance profit margins and improve cash flow. In June 2015, Supply Chain Digest surveyed over 200 supply chain professionals in a range of industries and roles. The survey provides a number of interesting insights into where companies are at in terms of global sourcing practices and technology support. When asked to rank sourcing factors on a scale of 1-10 (10 being most important), total landed cost, a more sophisticated approach to price, scored just behind unit price with a score of 5.8. 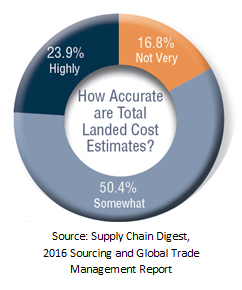 When asked if these supply chain professionals accurately calculate total landed cost, only 24% have faith that their numbers are highly accurate. Given these responses, there is an obvious lack of capability to pull the data together and arrive at a conclusive summary. As mentioned above, it is critical to remember that total landed costs are dynamic, not static. Sourcing decisions are made frequently based on estimations in unit price and total landed cost yet changes in shipping rates, bunker fuel costs, currency values, execution efficiency and other logistics costs can quickly add to the actual total landed cost. So, of course it is judicious to trade actual total landed costs and compare them to estimates, enabling companies to be able to explain and perhaps mitigate unfavorable variances over time. Supply chain-oriented companies also use this information to refine future total landed cost estimates. Technology solutions, like Amber Road’s planning tools and total landed cost calculators, allow organizations to compare sourcing scenarios to make important purchasing decisions. By providing specific inputs, such as product classification, source and destination countries, INCOTERMS, etc., you can see a detailed analysis of the specific supply source and understand the effect on the estimated landed cost when variables change.Changing the variables in the landed cost equation gives sourcing teams that ability to model a more complete picture of overall cost, time to delivery, mode of transport, route, and compliance implications associated with each sourcing decision. This type of functionality makes it possible to factor the complete spectrum of landed cost components - including unit costs, transportation, duties, taxes and fees imposed by governments worldwide - into the picture. Agree or Disagree with Our Expert's Perspective? Let Us Know Your Thoughts at the Feedback section below.